I find Easter time is just filled with chocolate. I didn't think you'd ever hear these words out of my mouth, but it's too much chocolate. So I decided that for our Easter egg hunt, there would be none. It would be totally chocolate-free. 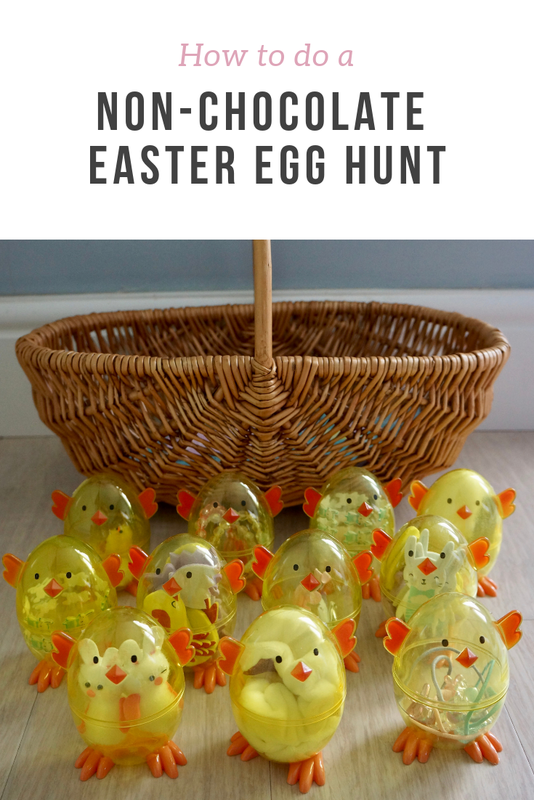 Here are my tips on what to include and how to make a non-chocolate Easter egg hunt a success - and links to products would might like to try (affiliate). I've previously done also non-chocolate Easter baskets so check my ideas here! My original worry was that my daughter would be disappointed with not having chocolate eggs, but this could not have been further from the truth. When we first did this for our then four year old, I asked her what did she think of the Easter Bunny not bringing chocolate. She said the toys were much more fun and that it was "The best Easter ever!". You might want to try this too if you find you already have too much chocolate (from well-meaning friends and family) or if there are allergies in your house - or if you just fancy a change! 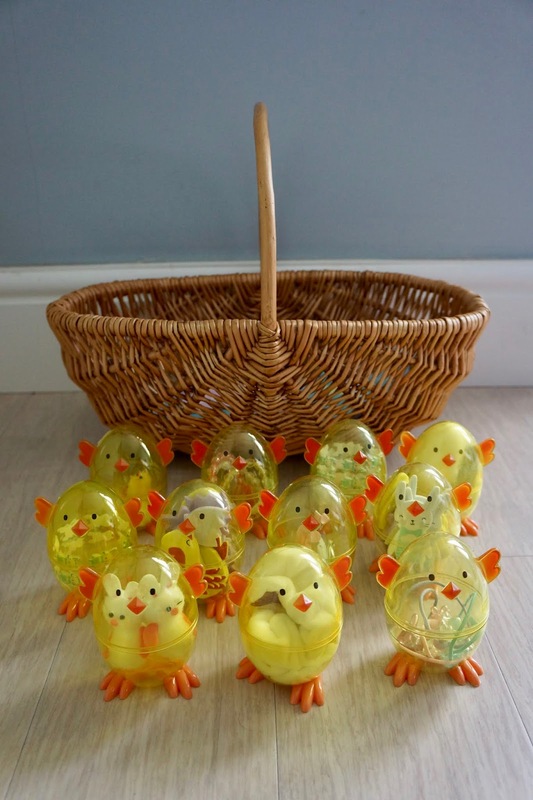 What you need are empty plastic Easter eggs and lots of tiny items to fill them with. Before you go out shopping a little pro tip here - check what you already have back home. Kids have so many tiny little toys and kiddy jewellery forgotten at the bottom of their drawers... I found this was a great chance to re-introduce some of those forgotten little toys and get a bit of joy out of them before they end up in the bin. Anyway, for the other stuff you might like here are my tips. Empty Easter eggs - I bought mine from Paperchase and this year they have slightly different eggs. You can find similar ones on Amazon too. I prefer the eggs to be decorated somehow and have cute patters - to look like little chicks for example. If you are not fussed though, most supermarkets stock plain plastic re-fillable eggs, which are quite affordable! These help in keeping the items dry and easier to find. 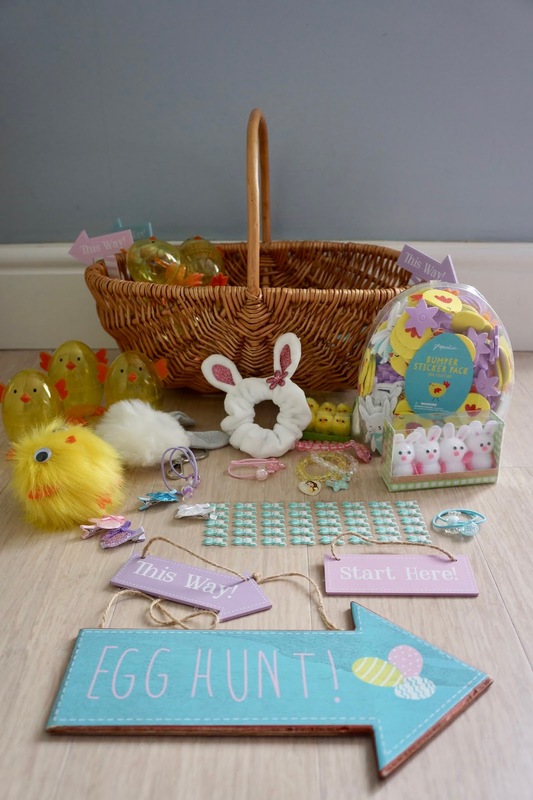 I've also liked wooden Easter Egg hunt signs - they stay good for years so you can reuse them again and again. Remember to save the plastic eggs as you can reuse them the following year for another Easter egg hunt! Stickers - Kids love stickers right? These are handy as you can buy a multipack of stickers and divide them across eggs, or a few sheets and cut them into smaller sheets. Bunny stickers and easter stickers work well. Hairclips and other accessories - If you've got girls these are great things to include in the Easter Egg hunt. Cute and practical. I included a variety of bunny themed hair accessories, and you can often find Easter themed accessories around Easter too. Small decorations - At Easter time you can find these tiny little fluffy chicks and bunnies that are used as decorations and in crafts. They are great to include as they are small and very cute, so kids love them. Keychains - I found primary school kids have this thing about keychains. 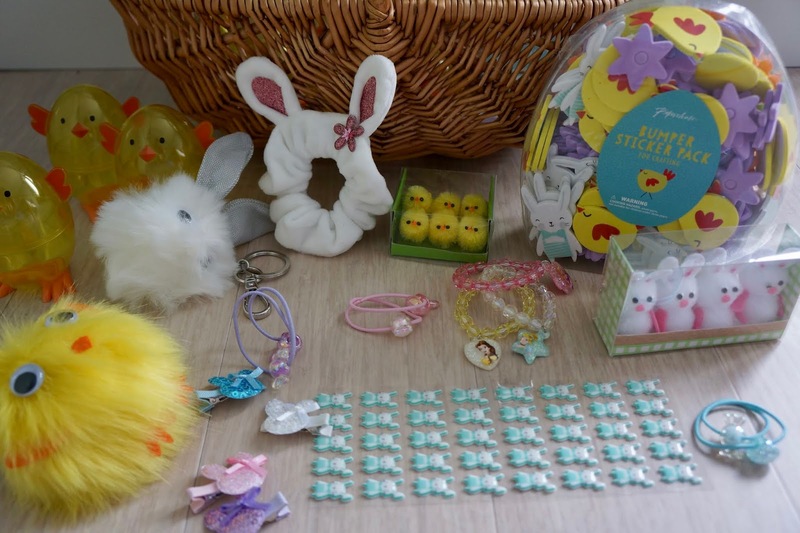 It seems to be very trendy now to decorate your bag with different kinds of keychains, so these Easter themed ones and bunnies were a great success. Healthy snacks - Why not include some tasty snacks for the kids? Raisins, dried fruits, fruit rolls etc. My kid especially loves Bear Nibbles, much to the chagrin of my wallet. Right, I'm not gonna kid you as this will be more expensive an Egg hunt than if you just bought little chocolate eggs... But you can bring down the costs by buying stickers and those small craft decorations, both are cheap and plentiful and you can divide one pack across several eggs! You could also hoover around the kids rooms to find any old discarded tat they love but have forgotten at the bottom of their drawers - you know there are plenty of those things - and re-introduce them! And if you are thinking of Easter baskets for your kids, check my ideas for non-chocolate Easter baskets! What else would you include in a non-chocolate Easter Egg hunt? Thanks so much! Yes this is perfect for kids with allergies or other dietary constraints - no one needs to be left out. I've only done this once, but will definitely do again! What a great idea for Easter. Love all the items and ideas. I will definitely use it for my boys. Thank you - I hope you have fun doing this! Aw this made me smile. :) How cute!